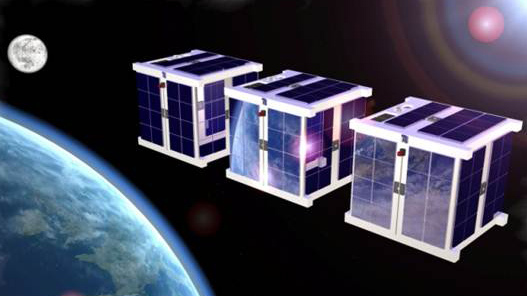 The market for small satellites has extremely grown in recent years and offers unprecedented potential for small and medium-sized enterprises. Start-ups like Skybox, Planet-Labs or UrtheCast make spectacular satellite fleets, investors said. So far “high-tech factories” and small quantities at high prices dominated the satellite manufacturing business. With high-resolution images and videos, high overflight and new business models these new players are leading the established satellite manufacturers to rethink their business approach. For example, the partnership with OneWeb inspired Airbus Defence and Space – Europe’s largest aerospace company – to develop innovative designs and processes that reduce the cost of high-volumes drastically. The constellation of 648 microsatellites will allow from 2018 world affordable access to the Internet. A growing New Space Economy is being built, which has already produced more than 100 companies. Worldwide Venture Capital Funds support this aerospace startups with fresh capital, as high returns are in sight. In order to detect innovative solutions and new business models for the space industry of the future, the new ideas competition INNOspace Masters award under the motto “Satellite 4.0” prizes innovative ideas along the entire value chain of satellite manufacturing. Addressed are small and medium enterprises (SMEs), research institutions, universities, as well as start-ups – especially those that have gained experience in the field of industrial 4.0 in space amd related industries and therefore would like to show new perspectives to the space industry. The partners in the competition are the German Center for Aerospace, Airbus Defence and Space as well as the two German ESA Business Incubation Centers. Prizes in three categories will be awarded which require different maturing and innovation degrees of ideas and projects. “The INNOspace Masters is an excellent way for companies and research institutions from non-aerospace industries for the first time to present their innovations in relation to the space industry,” explains Dr. Gerd Gruppe, Director of the DLR space management. “We are looking for innovation along the entire satellite value chain – from the definition, design, manufacture, assembly, integration and testing through the launch, operation and evaluation -activities with the main focus on the application of industrial standards and processes,” continued Dr. Ulrich Kübler, Director of Business Innovation, Intelligence & Future Trends in Airbus Defence and Space. An excellent example of how companies from other sectors can be facilitated to enter the new space economy, are the so-called SpaceCOTS® – Commercial-Off-The-Shelf components. Today who want to buy components – for example, for the construction of small satellites – , is facing a difficult choice: either to tolerate long approval times and high costs (involving strict regulations of the international arms trade – ITAR), or he can opts for COTS, i.e. cheaper standard products “off the shelf”. In the latter case, however, there was no way so far to qualify COTS components for use in space. The Bavarian Start-up Spectrum ARC provides with SpaceCOTS ™ a low cost alternative by assuring the highest ESA and NASA testing standards. This way commercially available parts became qualified for the satellite construction. “The use of components that have already been qualified by vibration, shock, thermal vacuum and radiation testing, it allows also start-ups and small firms to be part of the New Space Economy” explains Thorsten Rudolph, Managing Director of Application GmbH Oberpfaffenhofen (AZO), which organizes the INNOspace Masters. Do you have an idea for optimizing the value chain in the satellite sector? Then you take the chance of support from the world-class partners to win the Masters INNOspace. As a winner you will receive the best possible support in addition to extensive marketing and communication activities as well as worldwide network contacts also technological and economic assistance to the implementation of their project. Register now! –> The submission phase ends on 31 January 2016. The company has been selected by the ESA BIC programme in order to work on and develop a remote monitoring system for environmental monitoring and security. Our objective is to collaborate with ESA by using Earth Observation data and making it available to the public sector and to everyone in Europe. Spectrum ARC will be hosted at the ESA Business Incubation Centre Bavaria, located in Oberpfaffenhofen, close to Munich, Germany, from November 2013 for two years.